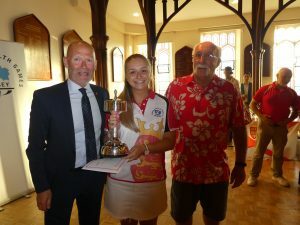 Congratulations to Sophie Le Blond on winning the Ken Webb Trophy. Well done Sophie on winning the Ken Webb Trophy last night at the Gold Coast Jersey Team reception. Also congratulations to all those presented with a certificate of merit for their achievements at the games. They were Barry Le Cheminant, David Le Quesne, Cameron Pirouet, Harry Shalamon, Malcolm de Sousa, Derek Boswell, and Ross Davis.